With the success of Go 8 Bit on UK TV channel Dave, broadcaster UKTV have not only commissioned a second series of the gaming panel show, but a companion spin-off called Go 8 Bit DLC. Airing straight after an episode of Go 8 Bit, this review show will take a slightly more serious approach to games, discussing news from the week complete with “lively debates and reviews”, according to UKTV. Looking for things to play on the show? Why not check our list of the PC’s best multiplayer games. Hosted by former Eurogamer journalist Ellie Gibson and with the help of Go 8 Bit team captains Steve McNeil and Sam Pamphilon, celebrity guests will join in to discuss the gaming week that was, with Dara Ó Briain popping in to talk about his favourite games. Imagine it as the gaming equivalent of The Apprentice: You’re Fired but instead of talking about why someone failed that week’s task, the panel may discuss the finer points of the 30fps/60fps debate. In a statement released by UKTV, senior commissioning editor Iain Coyle said that “after the great success of Go 8 Bit, it’s a logical move for us to further engage with the gaming audience. 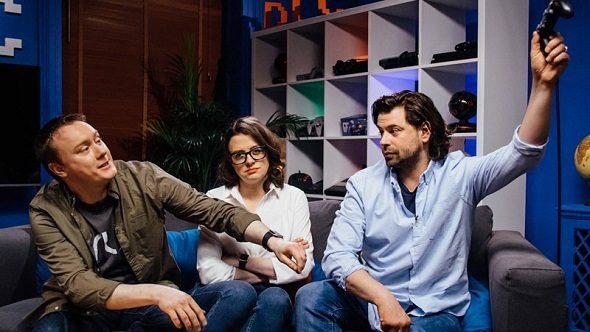 Go 8 Bit DLC is a great fun show on its own terms and I’m delighted that we’re also extending our relationship with Ellie, Steve and Sam”. The second series of Go 8 Bit and Go 8 Bit DLC will start airing on May 15 on Dave, so tune in then for some positive gaming chat. Mainstream TV coverage of videogames has come on leaps and bounds recently, with Ginx TV’s 24-hour esports channel providing a constant stream of games programming, alongside the Radio 1 Gaming Show and Swipe from Sky News. It’s a far cry from the old days of GamesMaster, Gamezville and When Games Attack, that’s for sure.